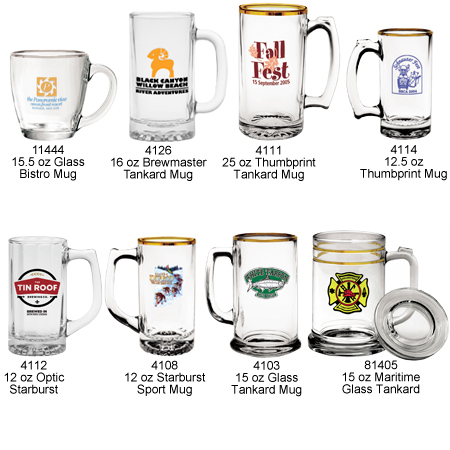 We offer a wide selection of unique Custom Glass Mugs, such as our Custom 16 Ounce BrewMaster Tankard Mug, our Custom 15 Ounce Glass Tankard Mug, our Giant 15 Ounce Custom Thumbprint Tankard Mug, Custom Sports Mugs, and many others. Your Customized Glass Mugs are imprinted at heats up to 1,200 degrees Fahrenheit to ensure that your imprint is durable and long lasting! These Custom Imprinted Glass Mugs are great for bars, restaurants, cafes, clubs, fraternities, sororities, and more. The Custom Imprinted Mugs also make great promotional give-aways at trade shows and special events. 5344 15.5 oz. Glass Bistro 4.17 3.76 3.65 3.55 3.43 3.30 2" 1-3/4" 9-1/4"
4126 16 oz. Brewmaster Tankard Mug 4.22 3.79 3.63 3.52 3.41 3.18 4" 2-1/4" 7-1/4"
4111 25 oz. Thumbprint Tankard 4.65 4.21 4.03 3.91 3.77 3.53 4-1/2" 3-5/16" 8-3/4"
4114 12.5 oz. Thumbprint Mug 3.12 2.76 2.64 2.56 2.48 2.31 4" 2-3/8" 6-3/4"
4112 12 oz. Optic Starburst Sport Mug 3.95 3.75 3.64 3.55 3.45 3.35 4" 2-3/8" 6-3/4"
4108 12 oz. Starburst Sport Mug 3.45 3.15 3.04 2.95 2.85 2.75 3" 2-1/8" 6-1/2"
4103 15 oz. Glass Tankard 3.65 3.26 3.12 3.02 2.93 2.73 2-13/16" 2-7/16" 6-7/8"
81405 15 oz. Maritime Glass Tankard 3.59 3.19 3.06 2.96 2.87 2.67 1-5/8" 2-3/8" 7-1/2"